I would like to have a German kitchen in our new house and am considering getting a kitchen company to supply this rather than use the builder and his cabinetmaker. I am hoping this saves some money, plus I know what I'm getting with the kitchen company. If I go down this route the builder said I may as well get the kitchen company to do all the joinery in the house, and they've said they can do that. Has anyone else done this and if so, why did you do it, and how did it work out? And, any opinions on Nobilia? I had a Sherraton (British made) kitchen in my last house and it still looked new after 10 years, and I think Nobilia is similar range (but better...). We have all our joinery separate to the build. Easier and the builder prefers it, less bother for him than to get a subbie and warranty it etc and deal with us for all the details of the kitchen. Not worth the margin to him. Hasn't happened yet but so far so good. You can spend a lot more time getting the detail of your kitchen right then. 3. Kitchen and bathrooms fitted. This will require a plumber and electrician so I'm not sure whose we should use.....would rather have the builder's plumber so they can take responsibility for all bathroom pipes being in right place, and waterproofing being done properly etc. If your builder is happy for someone else to do the joinery they should be amenable to having those trades on site during build. You will need the kitchen place in sooner than that to assist with placement of their own lights if supplied, rough in of appliances etc. Your builder will also need to plaster in space for your range exhaust etc and there will be other details that involve him like nib walls etc if any. Our builder has been happy to work with the joinery place in terms of them coming on site when the kitchen is ready. We actually met both on site to work out final details such as vanity placement, additional wall to mask fridge, range exhaust etc. Bathroom as you say plumbing etc needs to be right. Also it depends what floor you go for you will probably be better to have it done first. Nt to mention, if borrowing your bank won't make a final payment without a complete kitchen and bathroom. unfortunately I saw your thread only now. I'm originally from Germany and have some understanding with German kitchens in Germany. The main reason why I didn't buy a German kitchen here in Australia because of the issues that can happen with the installation. Some parts might not fit, have been ordered wrongly or have been damaged through transport. I read about these things on a weekly basis happening in Germany. The other reasons why I would not buy Nobilia here, is the very limited colour options and the low carcass height of 720mm. In Germany the better quailty manufacturer all have a 780mm carcass. People are tall nowadays and you won't want have too heigh cabinet legs. I have chosen a local cabinet maker who uses Blum hardware. The kitchen cost me twice as much as I would have paid in Germany. Overall, larger cabinet makers in Australia are possibly using the latest edging technology (laser), but many not. The better German kitchen manufacturer use 18 or 19mm fronts and frames and the backs of the cabinets are much better done than here. Australia hasn't establish "kitchen brands" as it is the case in Germany where you go to the kitchen studio that sells the brand you are after. The better German kitchen manufacturer use 18 or 19mm fronts and frames and the backs of the cabinets are much better done than here. . I run an Australian kitchen company, we have always used 18mm fronts and solid backs, we also use all Blum hardware. No difference to the Germans! To echo what CEK is saying above Evelin. There are cheap kitchens that use 6mm masonite backs, cheap drawer runners and hinges, plastic legs etc and then there are the better ones that use solid backs, quality hardware and proper plinths. You can also choose whatever height benchtop you want. Years ago I worked for half a dozen kitchen companies installing cupboards from cheap basic ones going into multi-storey blocks of apartments to high end ones in multi-million dollar homes. I also got to see a few imported ones - a couple of Pogenpohl ones and an Italian one whose name escapes me. They were nice but I wasn't overly impressed considering the money the people spent. A good local kitchen maker could have done as good a job for many thousands of dollars less. 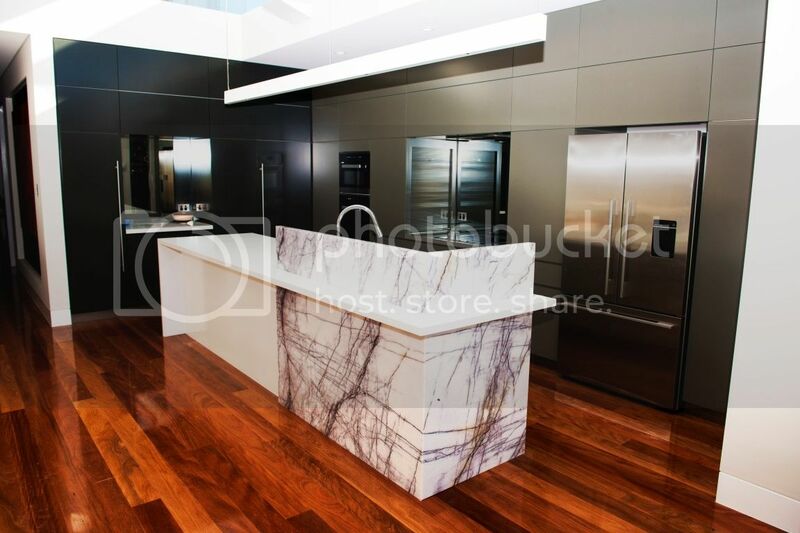 I bought my kitchen in Perth from a top kitchen maker with awards andsoforth. The cabinets are 16mm, front and cabinets, no laser edging although I believe they meanwhile bought a machine for it from Germany. The bit that goes across on top of the cabinet under the benchtop (don't know how you call it) is as cheap as chips. If you buy a medium to high end kitchen in Germany, all fronts of the carcass are of front material and colour. I will search my laptop to show you how the backs are done in Germany at medium and high end kitchen maker. It's not just a square box, there is a gap between the wall and back panel. There are many different elements I could list. It is the fact, that large kitchen manufacturers which do sell thousands and thousands of kitchen around the globe, are better (advanced?) equipped than a small scale kitchen maker with 20 or staff. The economy of scale doesn't work in a small place. I had to wait for my kithen to be installed for 3 months as they are busy (the make about 15 kitchens at any one time). But besides the fact, who is better, what is good or not, it puzzle me since I'm living here (20yrs), that, despite a rather large kitchen market, nobody has developed am Australian wide kitchen brand. IKEA is doing very well with kitchens here and their cabinets are 19mm and of good quality if you ignore the fact that most fronts are only vinyl wrapped. When I planned to buy my kitchen 3yrs ago, we went to a few places, like Nobilia and Australian kitchen makers. The customer service was so awful, the knowledge so poorly that we walked out of quite a few. You would think, that on a Saturday, when most people come to the store you would have staff in there who have some knowledge about kitchen. No, in many cases only a receptionist, 20yrs old, represented the company. One company refused to do a kitchen for us, because we were too far away (55km). Hello, we are living in Perth. But back to Nobilia. I would not buy a German or any other foreign kitchen brand here in OZ exempt for the high end once like Eggersmann, Poggenpohl, Zeyko, because of the risk that comes with damage through transport, missing pieces or wrongly delivered parts. The other thing of course is who installs the kitchen if it is foreign? In my case, the kitchen maker sends out there own qualified carpenters for installation which I highly appreciate, they were brilliant. And the prices. I know of people here, who earn more money than they need, refuse to pay the prices they were quoted for a new kitchen and turned to IKEA. We are talking of quotes for a kitchen with only drawers, Blum, Antaro, Intivo. II will search my laptop to show you how the backs are done in Germany at medium and high end kitchen maker. It's not just a square box, there is a gap between the wall and back panel. Umm, ok nothing new there. I have been doing that for 20 years. I think you have used cheap nasty places in Australia. Trust me there really isn't any difference between a top end German kitchen and a top end Australian kitchen. You just need to know which company to use! You keep banging on about laser edging(sure its good) but, personally I wouldn't put that into a high end kitchen. All those products are just a fad and will be gone in a few years!! Try having one door replaced if its damaged 3 years after the kitchen has been installed. I bet the colour wont even be available!! Polyurethane really is much much better!!! Last edited by CuttingEdgeKitchens on Mar 09, 2016 12:46 pm, edited 1 time in total. I think the point Evelin is making is that quality should be affordable and it's not due to missed opportunities in technology, economy of scale etc. She is saying quality costs too much. Germany is amongst the most advanced in the world in manufacturing methods. I think if we dont support our own , then good luck when our kids want and need jobs, clearly we have many options here in Australia, from cheap and cheerfull to high end, , dont whing quality cost too much here while u enjoy a good living, , Its utter hypocritical. I happily chose a geelong local whom did a great job, not ran overseas and put up a finger at the very country whom we are lucky to live in. I think the point Evelin is making is that quality should be affordable and it's not due to missed opportunities in technology, economy of scale etc. She is saying quality costs too much. I don't agree! Have a look at the picture of the kitchen above. The big companies would charge stupid money for that but my customer got it for a great price! You can get a top quality kitchen at a very affordable price by going to a good cabinet maker or a small kitchen company. For some reason the general public think that you should go to the big kitchen companies, more often than not all you will get from them is a less than average job and a big big bill!!! Not making a comment on kitchen companies here - you will see I said above I used a smaller company. I'm just making a generalised comment on the status of manufacturing as an industry in AU compared to Germany/EU. The Germans have been amongst the best in the world at capitalising on economies of scale and being able to produce both volume and quality at a fair price. This is due to sophistication in engineering and systems of manufacture, for which they are renowned. You simple don't get that same combination of quality and price in AU mass produced items. That's just an academic point, it's a different argument to whether it's worth importing a kitchen, though. I think everyone needs to do their homework and see what you get for your money. Sure there will be substandard work in every field and there will be the ones who take pride in their work. Quality does cost no doubt about that. Unfortunately I think in Australia crap is too expensive that people always want a bargain and dont want to pay for quaility. I would rather pay a little more and get something built with pride and craftmanship than to save a dollar. Especially when the kitchens and bathrooms will likely be there a lot longer. Funnily enough I have gone for blum throughout my entire house for all wet areas and kitchen as I like the product. I think most of the brands I got were German and the difference in price was not outrageous. BTW Love CEK's kitchens, the fact he is active on this forum and give lots of advice goes a long way. Agreed on all fronts. I'm loving or kitchen so far and it's nice to know its made locally. They've been happy to redraw it I don't know how many times and have been so helpful. Can't wait until the stone goes in tomorrow and I can actually see the finished product! oooh Leksie.... I like your laundry and may have to leverage your setup into my laundry. Thanks.. Oh you totally should.. I leveraged it off TravisAUs amazing house.. The hanging rail anyway. Of course mine isn't quite so amazing hehehe. I didn't go for a full bank of overheads since I'm not that tall, and didn't bother with a bulkhead though that would have tidied it up. The splashback still needs to be done.. seem the tiler ran out of tiles?!! I think it will be a good practical set up. The bench has a grey detail through it but you can't see it in pics. I purchased Nobilia kitchen through Kutchenhaus in Willoughby Sydney. It's the worst service ever! Just cabinet installation already dragged near 5 months, parts missing and flaw parts, wrong specification. The worst is the customer service, they simply don't care, most often no respond at all. During the 5 months we squeezed all cooking stuffs in a dinning table, use garden tap for clean water and toilet as drainage. Have suffered lost timely, financially and bodily by eating out more, countless communications and depression. Consider the worst services during the installation, how can you imagine the 'guarantee service' will be when the cabinet goes wrong? Will definitely never recommend or shop from them again. Owner supply balustrade before or after handover?Owner supply balustrade before or after handover?